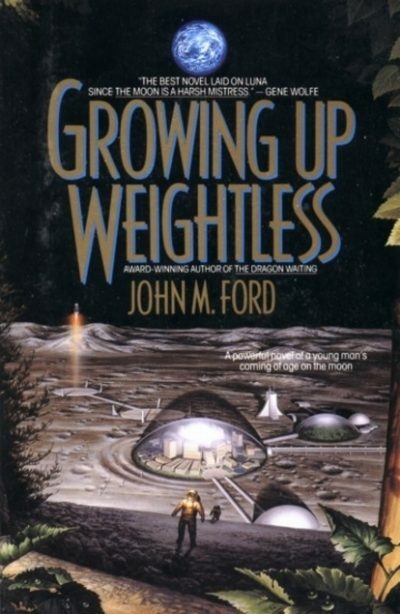 John M. Ford’s Growing Up Weightless is a standalone coming-of-age novel. If Luna had an Age of Heroes, that era is long over by Matt Roney’s time. Independence from Earth was won decades ago. Geniuses gave humans starflight; by Matt’s era, interstellar travel is mundane. All of the interesting things have been done by previous generations. What is a teenager to do with himself? To be honest, Matt does have a wealth of opportunities. So many that he cannot decide. Nor is it clear that any of them will offer him the independence and self-esteem he craves. It’s not just unrelated oldbies who have done all the cool stuff; one of those oldbies is Matt’s father Albin. He’s a senior official in the lunar government. He’s smart, well-connected, meticulous … and to Matt’s eyes, cold and judgemental. For Matt, Albin is an obstacle, not a resource. Matt’s view of Albin is unfair. Albin is supportive; it’s just that he is busy as hell. Luna is a dry, dry world; water is a limiting resource (one of the main ones, to be exact). As the lunar population and economy grow, the Lunarians will exhaust their known water supplies in the foreseeable future. Earth-based Vacor says it has a solution, but for historical reasons Albin is wary of terrestrial entanglements. While Albin wrestles with ensuring Luna’s future, Matt and his friends set out on a covert foray that will take them on a tour round their frontier world. It is best not to think about the novel’s timeline because it doesn’t work. Let me explain at greater length why you should not think about that, as compressed timelines are encountered in SF from time to time. We’re told that interstellar flight has only been around for less than a human lifetime, but what we’re told about the extrasolar colonies suggests that there’s been centuries worth of cultural divergence. The lunar history is also improbable. Luna appears to have gone from the first crewed habitation to a nation demanding independence in an implausibly short time. I’ve seen this sort of compressed timeline in other works of SF. Sheffield had the Belt developed enough to fight a genocidal war with Earth by the 2070s, while Pournelle’s Co-Dominium managed to go from the design for an FTL drive in 2004 to extrasolar colonies by 2020 despite lack of governmental support for R&D. These choices were probably driven by the demands of narrative. Most historical processes happen at a slow pace (decades or centuries of slow change, possibly leading to some seeming-sudden development). Ford’s model for his moon might be the American revolution, as channeled via Heinlein’s The Moon is a Harsh Mistress. In the real world it took about almost three centuries to go from the catastrophe of 1492 to the Declaration of Independence. However, no hypothetical moon colonists of the 21st century will want to wait until the 24th century for their glorious revolution. Lunarian society might seem like a utopia from our current vantage point. Luna is a decent place to live. Nobody is homeless, hungry, or worried about paying for their next shot of insulin. Matt is troubled by an excess of career alternatives, not worrying about limited, dead-end, starvation-level futures. But … a complete utopia wouldn’t tolerate the sort of casual bigotry Matt has learned from Albin. If Matt and Albin are reliable examples, Lunarians are a prickly folk who don’t think much of people from Earth. Still, it’s a muttered-insult sort of bigotry, not lynch-mob bigotry. It is also understandable, given Luna’s precarious existence: if their economy ever tanks badly enough that they cannot maintain their infrastructure, the moon cities may join Petra in the dustbin of history. Ford never liked explaining the obvious. Sometimes readers find his obvious somewhat opaque. Such readers tend to bounce off this book. But if you actually like figuring out how things work from the usual SF inclueing, you may love this book to distraction. Growing Up Weightless has lots of conflict but very little drama, something that might have worked against the novel getting wider recognition. So too might Ford’s comparatively supportive view of government: this isn’t the usual feudalism-in-space or libertarian tosh. Luna is an effectively managed community and its people are (prejudice against Earth aside) a sensible lot, so the sort of contrived excitement other authors might have written into the plot just is not in the cards. Rather than explosions, decompression events, or malevolent socialists, the novel is driven by character. Growing Up Weightless is out of print, which is a shame. Certain authors could learn from its example. There are entire generations of readers who have never had a chance to read and enjoy it. Nothing to be done, though, aside from waiting for it to come into the public domain some time towards the dawn of the 22nd century. Or later, if Disney has its way. The "To be honest" paragraph is repeated. Go on, admit it. What you wanted to write was “to go from the catastrophe of 1492 to the catastrophe of 1776”, wasn’ t it?